The Erimian Wingflower is one of the rarest and least understood creatures of the Lands of Dream. During the day it sits in bright places, resting and soaking in the rays of the sun; to many it then seems almost a regular flower, simply positioned in an odd place. But at night it flies away, rarely ever returning to the same spot, and on silent wings it crosses miles in search of water. Having drunk its fill, it then flies many more miles to find a place to spend the day. That much is known, and by itself is enough to make one wonder at these most unlikely of beings. But there are many mysteries yet unsolved about its nature. Why are they always wandering, and do not simply remain near one water source until it is exhausted? Why do they live almost exclusively in deserts or desert-like environs, and are rarely if ever seen where water is plentiful? And why is it that once a year, every single wingflower in the world disappears at sunrise only to reappear at sunset? Perhaps the latter is only a myth, and the evidence for it a coincidence. 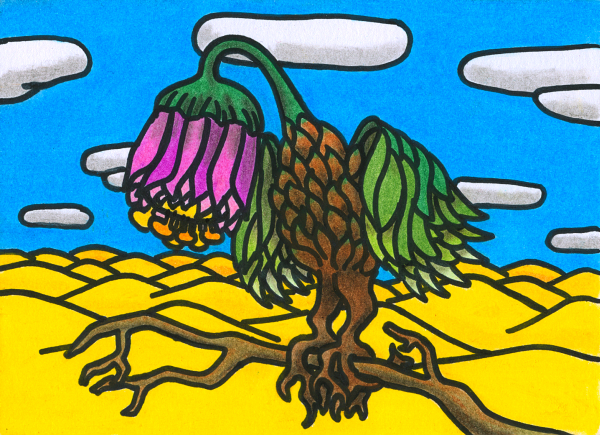 The same could be said of the stories told by desert travellers, who have observed the wingflowers gather, like flocks, to put down roots around oases while the night is deepest, and who report that the wingflowers seem to speak to one another without speech. Some even claim that they have heard the whispers of the wingflowers in their sleep, and a few have said that the wingflowers do not speak, but sing. The most detailed book compiled about the Erimian Wingflower was written by someone whose name is not known; the manuscript was found in a small cave in Azrakhan, with nothing at all to suggest the identity of the author. The last two pages each have only one sentence on them. I have never seen anything as beautiful and sad, reads the first. The second one says only: They are searching for something. This entry in the Oneiropolis Compendium was made possible by an anonymous supporter from the Seven Mountains of Possibly.